Contact | Custer Electric, Inc.
"The university is moving forward with projects to install sports lighting on both the softball and baseball fields, and we are pleased to be partnering with Craig Custer." 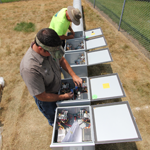 "Craig Custer provided Cardinal Ritter High School with field lighting products that correctly matched all of our needs. We are very pleased with the attentiveness to details they placed on our project."